I have been speaking on career development topics for over 5 years. This includes conference presentations, training programs, and even college courses. I pride myself on creating presentations that are engaging, visually appealing, and strategically designed for specific audiences. From the classroom to the boardroom, my talks can be tailored to fit any situation. I have showcased some of my more popular sessions, but presentations can be created and customized to fit any group or environment. I prefer an active/hands-on learning approach which keeps participants engaged, while inspiring the curiosity to learn independently. This presentation is accompanied by an interactive worksheet that focuses on marketing your current experience on a resume. It's perfect for any group that is looking to help its employees/members recognize their accomplishments and motivate them to achieve more! It is new, fresh, and reflects best practices of resume writing in 2019. I absolutely loved creating this presentation and the visuals are enough to keep anyone entertained. Don't you want to see what resume shenanigans this confused caveman gets into? Most participants claim to hate writing cover letters before this presentation. This topic continues to be an area where I see the most growth before and after. This highly-interactive presentation uses marketing and advertising strategies applied to cover letters to compel employers to reach out. This workshop features various superheroes helping participants learn to write a SUPER WONDERFUL AMAZING cover letter. WOW! Personal branding is more important now than it ever has been. What result does your name produce from a Google search? Go ahead and take a look now. This will still be here when you get back. Did you like what you saw? Did you even show up on the first page of results? This presentation is designed to help participants establish their online identity and begin to build their reputation online through social media & blogging best practices, entrepreneurial skills sets, and some industry secrets. Personal branding requires a lot of planning, building, and imagery. This construction theme and workshop will be the blueprint on your path to success. 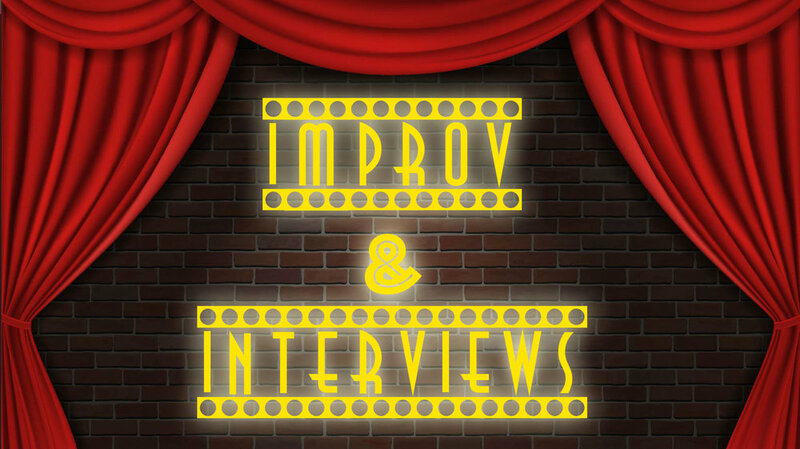 Have you ever thought about how much Improv and Interviewing have in common? This fully interactive workshop will leave participants sore from laughter and ready to seal the deal on their next job interview. Did you know that 87% of recruiters use LinkedIn to check job candidates? LinkedIn has gained a lot of traction as a recruiting tool in the past few years, and it only continues to grow. LinkedIn is the perfect place for professionals to establish their professional brands online. In this workshop, participants will learn the best ways to optimize their profile as well as strategies to develop engaging content for their networks.